The debate over the weekend with Sonny Hernandez and Theodore Zachariades versus Leighton Flowers and Johnathan Pritchet is the most interesting debate in recent years. It is…cathartic, to watch. You can see it below. There are five reasons, right off the bat, that you should watch this debate for yourself. 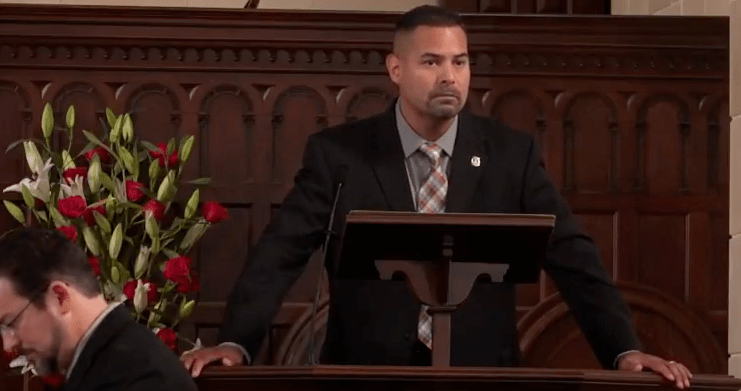 Hernandez uses the term “polemical” in the first minute of the debate, and then proceeds to explain that this is not an intramural debate between otherwise like-minded Christians. While Flowers and Pritchett (who took the semi-Pelagian side in the debate) affirmed the brotherhood of Hernandez and Zachariades, Hernandez and Zachariades no short of anathematized their opponents. Zachariades called the two men his “brothers,” at one point, but then paused and apologized for his word, clarifying that they were not his brothers. Multiple times, the words “heresy” or “heretics” were used to describe Flowers and Pritchett. Let’s be clear: Leighton Flowers hates the gospel, hates the God of Scripture, hates free grace, and seeks to place man upon the glory throne of Christ. Flowers has gone on a one-man crusade to defend the virtuous nature of man, attack the doctrines of depravity, and twist the Holy Scriptures to make Jesus into a worthless potential Savior. Shockingly, Flowers admitted in his opening constructive that his opponents sought to defend the power of God, but that he seeks to defend the “character of God” (by insisting God tries to save everyone, bless his heart, but at least he means well). While namby-pampy, Interfaith-dialogue-having, bow-tied Calvinists might be horrified at the straightforwardness of Hernandez and Zachariades, the rest of us actually rejoice that God’s name and power might be defended and Arminians might be rightly handed over as unworthy of theological respect. Presuppositionalism oozed out of Hernandez and Zachariades as they repeatedly refused to give excuses for God, and they seemed altogether uninterested in making their position seem rational or respectable. Rather, the two Calvinsits threw down the Scripture and repeatedly challenged the two semi-Pelagians for deviating from it. While I do not think that misunderstanding the Ordo Salutis (believing faith precedes regeneration, as semi-Pelagians do) is necessarily self-anathematizing, the fact is, if someone makes it their career to challenge the sovereignty of God, it is rightful to presume that they are either lost or might as well be. For Calvinists who are sick and tired of seeing Leighton Flowers treated as a well-meaning brother and not an enemy of God, watching the repeated anathemas during the debate was a breath of fresh air. I haven’t listened to Theodore Zachariades before, but he was easily the most interesting part of the debate. Zachariades is a brimstone-fuming, fire-breathing, get-off-my-lawn Calvinist if ever there was one. Zachariades is from London, and was educated at Ontario Theological Seminary, Greek Bible College, and Southern Seminary. His accent is nothing short of spectacular, and combined with a deep timbre and intonation, he sounds like a Calvinist Ghost of Christmas Past, except angry. I literally enjoyed just listening to him talk, but when he would (seemingly) lose his temper, listening to his voice was fearsome. It was very clear that Zachariades had little patience for people he feels are heretics, and that reality bubbled to the surface of his discourse on multiple occasions. I would give a dollar to have watched the face of Flowers or Pritchard while Zachariades fired on them with both barrels like a pair of loose canons primed with black powder. On several occasions, when Zachariades was speaking, I said to my self, “Oh, snap!” and giggled silently, reaching for my imaginary bag of popcorn. Zachariades – and to a lesser extent, Hernandez – clearly were not planning on sitting by while their opponents challenged the authority of God. While they will be criticized for not having the right demeanor for debate, I would suggest that is only because we have been inundated with the soft-bellied, lily-livered, limp-wristed creampuffs who make up the children of our age. These men were all fire and lightning, and the respect given to Flowers and Pritchard was commensurate with the respect due. The Calvinist team will probably be raked over the coals in coming days for “filibustering” or “stonewalling” in the cross-examination. Team Semi-Pelagian was trying to make Team-Calvinist prove they contradict their Confession (the Second London Baptist Confession has a portion devoted to free will, chapter 9). Knowing the Confession well, it does seem that Hernandez and Zachariades hold to a position not exactly articulated by LBC(1689) Chapter 9, in that they deny the existence of free will. The Confession, on the other hand, acknowledges (on some level) the existence of “free will” (at least prior to the fall of man, as explained in paragraph 3), although it denies that man’s will is free after the Fall, having been corrupted so as to be unable to do good (paragraph 4). Zachariades and Hernandez simply refused to answer any question dealing with the Second London Baptist Confession, on grounds that they were there to defend the Bible and not a secondary tool of edification. Regardless, Flowers and Pritchard continued to ask questions about it relentlessly. In debate, participants have a number of pre-game strategies in their head, particularly when it comes to cross-examination. You plan on asking Question A, you hope that your opponent answers B or C, and based upon their response, you follow up with Questions D or E. Sometimes, things don’t go the way you think they will and then you – if you’re smart – move on to the next question. While I would have gone into detail about what the LBC(1689) teaches in Chapter 9, apparently Hernandez and Zachariades didn’t want to take the debate off track and away from the Bible (Zachariades pointed out, tongue-in-cheek, that Flowers and Pritchard were the “traditionalists” that would care about Confessions, not Team-Calvin). That Flowers and Pritchard were unable to move beyond that point and continued to lob questions that Hernandez and Zachariades clearly weren’t going to answer, it wasted their time (and everyone’s time). I suspect that Hernandez and Zachariades simply weren’t willing to move beyond the previously-agreed-upon parameters of the debate and felt that the Confession would have been a red-herring distraction for the debate they wanted to have. Nonetheless, watching the two Calvinists simply refuse to go where they were being led was interesting and entertaining. Flowers is like the Internet atheist who is used to arguing with evidentialists who allow him to put God on trial. When confronted with a presuppositionalist who doesn’t allow what God has made to answer back to him, the atheist is flustered beyond all comprehension. Flowers and Pritchard were clearly like deer in the headlights, at times looked stunned, at other times were speechless, and afterward (if you’ve watched them in social media) likened Hernandez and Zachariades to “clowns.” Of course, these two were not clowns. They were, however, refreshingly blunt. There was also a degree of blustering surprise from Flowers that the two Calvinists didn’t argue like so many soft-determinists who he has debated before. Hernandez and Zachariades were clearly unapologetic in their defense of God’s sovereignty and it appeared that Flowers didn’t know what to do when they refused to argue in a way he had anticipated. This was actually impressive to watch. I was a tad apprehensive to see them attempt this, particularly as Hernandez began his first constructive, but by the end of the debate the two had gotten into their stride and it paid off. Their recitation of the Scripture from memory was commendable by any standards. The two may have been bulldogs, but they were bulldogs who were spitting out Bible verses like Rambo shoots out bullets. The debate is a quick 2.5 hours, and is well worth you time to watch. Grab a bag of popcorn.